I’ve often been asked what I do, where I’ve been and what sort of activities I’ve engaged in throughout my 50 years involvement in astronomy and space. Here is a brief overview written from a ‘non personal’ perspective. David Reneke, one of Australia’s most well known and respected amateur astronomers and lecturers, has over 50 years experience in astronomy with links to some of the world’s leading astronomical institutions. David is the Editor for Australia’s Astro-Space News Magazine, past news editor of Sky & Space Magazine and is now affiliated as a writer and publicist for the prestigious Australasian Science magazine. David teaches astronomy at college level, is an invited speaker at astronomy conventions throughout Australia, a feature writer for major Australian newspapers, and is a science correspondent for ABC and commercial radio stations. In these weekly radio interviews David regularly appears on over 60 networked stations across Australia with all the latest news and on general astronomy and space discovery issues. David’s audience numbers around 4 million listeners weekly! David’s media schedule includes appearances on regional, national and international TV. David has been featured on Regional TV stations in NSW, Good Morning America, American MSNBC news, the BBC, Spanish television and Sky News here in Australia. David is the prime media correspondent for Australasian Science Magazine. A list of all the stations David appears on is available on request. As host of his own program for many years, David has won major Australasian awards for his services to radio. David is a very experienced astronomy and space presenter who has entertained and educated many tens of thousands of people with his engaging shows in venues all around Australia. David has developed a style of presenting astronomy and space discovery to the public that is not only interesting but incredibly unique as well. He also produces a range of educational CD-ROMS on all matters associated with astronomy and space exploration for beginners. David also works on radio in the Hastings. He runs a 3 hour Breakfast program and weekly Country Music show on 2WAY-FM 103.9. Dave has a huge following and has won multiple awards for radio presentation. Since 2004, David has been touring most of the primary and secondary schools throughout NSW introducing a new interactive astronomy and space education program that he’s developed called ‘Astronomy Outreach’. Designed especially for Australian school students and their teachers, it gives students a refreshing new look at the latest discoveries in astronomy and space science. Austar and Discovery Science channel financially and physically sponsor David’s outreach program promoting him to schools across NSW. On a recent visit during 2009 the program donated a telescope and a $2,000 grant to each school visited. During January and February 2008, David toured the USA on assignment for Sky and Space where he was invited to attend the world press conference in New York for Sir Richard Branson’s new company, Virgin Galactic. David witnessed the unveiling of Branson’s brand new concept spacecraft ‘Spaceship-2’ heralding in private space travel. While most people try to simulate the experience by playing video games and watching sci fi movies, he was the only media representative invited to ride the astronaut training facility at the The National Aerospace Training and Research(NASTAR)headquarters in Philadelphia. David also visited several key space sites across America including a behind-the-scenes tour of the Kennedy Space Centre in Florida and attended the Winter Star Party in the Florida Keys. He was invited for a 2-night stay at Lowell Observatory in Flagstaff Arizona where he spoke to many professional astronomers and managed to peruse the actual documents and glass plates used by Clyde Tombaugh, the discoverer of Pluto in 1930. David’s trip finished up with the grand finale of being the invited guest to Buzz Aldrin’s home in Beverly Hills, California. 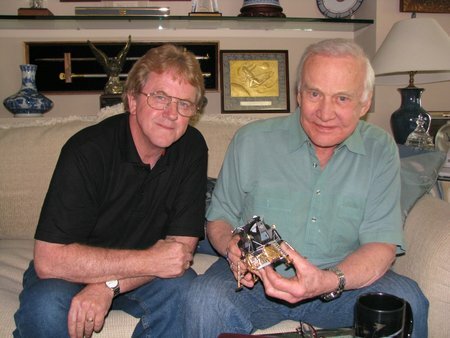 In a one-to-one personal interview and conversation with the second man to walk on the Moon, David has gained a much deeper insight of this history-making flight from the man who actually carried out this unique feat. In January 2010, David conducted a series of specialised astronomy/space talks on board Great Southern Railways train ‘Southern Spirit’ (sister train to the GHAN) and assisted at Parkes Radio Telescope as a special paid guest speaker for their ‘Platinum Service’ customers, travelling between Perth and Adelaide. In 2012 he was invited to Port Douglas Qld as guest astronomer by the Chamber Of Commerce to conduct eclipse talks and presentations during the 2012 solar eclipse. Throughout 2011 David was invited to head a number of tours with Grand Pacific Tours Aust. to Lake Tekapo in New Zealand’s South Island to assist in setting up Astro Tourism at their exclusive dark sky sites. From 2012 David has set up his own Astro/Space group ‘Mid North Coast Astronomy’ and has recently completed a 14 day cruise as guest lecturer and astronomy guide with Coral Princess Cruises (Cairns) in March 2016 for the total solar eclipse in Papua New Guinea-Indonesian islands. During May 2016 Dave assisted in the Australia wide promotion of the ‘Last Man On The Moon’ tour by US astronaut Captain Cernan and met up with Gene in Sydney for a one on one talk and photo session. During December that year Dave was also involved in promoting Buzz Aldrin and NASA/ESA dignitaries (Produced by Live on Stage Australia) in the National Geographic in the “MARS: The Live Experience” in Sydney Australia. Hosted by Ray Martin in a landmark live event exploring mankind’s current and planned space exploration technologies to reach the Red Planet in the next two decades. In March 2016 David was booked as the guest astronomer on board the Coral Discoverer for a 14 day cruise to Papua New Guinea and the Indonesian Islands by Coral Princess Tours (Cairns Qld) as astronomy guide and lecturer for the 2016 solar eclipse. In August 2017 Dave joined Tropical Sails Corp. on an 8 day/7 night ‘Eclipse Tour’ as invited guest astronomy lecturer (all expenses paid) and night sky guide for the “Great American Eclipse” in the USA. He visited 7 states and guided passengers through the eclipse from a Yellowstone National Park base and spent quite a bit of time behind the scenes touring the Kennedy Space Centre and other space facilities in Florida.